It is indeed difficult to find anyone who does not like chocolate. But what about those who love chocolate? I do not mean those who merely like chocolate a lot, or use the word love as a synonym for a weaker emotion. No: there are those who have a love affair with chocolate. These true Chocolate Lovers, or chocoholics as they are sometimes dersively called by those who do not understand the lure or delicious, mouth watering, divine chocolate, do not use the word "love" lightly. For them, chocolate is an indispensible part of their lives and diets. Let's face it. Chocolate is not a health food. No matter how many studies can be conducted at tax payer expense or sponsored by chcolate manufacturers, no one will ever convince me that chocolate (with all of its milk and especially sugar additives) is good for you. I am sure that if someone ever produced the chocolate equivalent of the movie "supersize Me" in which the protagonist spent a month eating nothing but McDonalds Food, the results on the waistline would be the same. However Chocolate lovers can take comfort in knowing that cocoa, the main ingredient of chocolate may in fact have some health benefits. So now we can rationalize our addiction. The evidence is far from conclusive so please do not adjust your diet based on the following anecdotes. In other words, if you start eating lots of chocolate and get fat or die, you have only yourself to blame! A study of a certain isolated Indian tribe in Panama whose members traditionally boil their water with cocoa beans found that the tribesmen had a lower incidence of cardiovascular disease. Members of the tribe who moved to the City had the same cardiovascular diseases as the general population. Scientists believe that the difference is due the fact that the flavonoids in chocolate can help lower levels of "bad" LDL cholesterol while boosting "good" HDL cholesterol. A Nigerian Doctor, the Director of the Fedeal Agency for Food and Medicine in Nigeria recently recommended using chocolate instead of Viagra (IMPORTANT DICLAIMER: do not follow this advice. We do not want to be sued). The Doctor cited a study conducted by the same institute which indicates that consuming cocoa beans has the same effect as the prescription drug, if not better. However readers should take note that the this scientific study also makes reference to the recent campaign by Nigeria to promote cocoa production as an export crop, so the findings may be a little self serving. Be that as it may, the fact is that true chocoholics do not need these excuses to indulge their love of chocolate. Because this addiction does not carry the social stigma of illegal drugs and is not likely to reduce you to begging on the streets for spare change or trolling the streets as a "crack chocolate whore" to finance your next fix, many businesses have sprung up to cater to this sweet addiction. 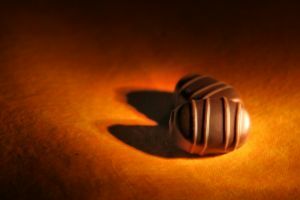 For example, one travel agency [site] offers 7-day Escorted Tours for Chocolate Lovers & Chocoholics through Belgium.